Some say that the term "green" is due to the acidity and freshness characteristics of Vinho Verde and reminiscent of the fruit still green. Others claim that the "Green" origin is explained by the fact that wine be produced in a region rich in vegetation and therefore very "green" even in winter. The outer boundaries of both the “Vinho Regional” Minho and DOC Vinho Verde are the same, stretching from the River Minho in the north, which forms Portugal’s border with Spain, as far down the coast as the city of Porto (Oporto), but inland extending a further 30km south of the river Douro. Cool, wet weather always makes ripening more difficult, but the climatic problems were long compounded in the region by the tradition of training vines along pergolas on the edges of fields, and sometimes up trees, in order to gain space and free up the centre of fields for other crops. There are many smallholdings (many are really small), and grapes are still often trained in this way, but modern vineyards, and certainly the vineyards of major estates, are now low-trained on wires, giving better exposure to the limited sun, and better ripening. Vinho Verde is still distinguished by its high acidity. Flavour depends on the grape varieties used - floral Loureiro, steely Trajadura, mineral Arinto (known here as Pedernã), creamy and mineral Avesso, and the fine, mineral, subtly fragrant Alvarinho. Azal Branco is hard to ripen and declining in popularity, and in any case tends to get blended with more aromatic grapes. Most white Vinho Verde can be relied upon to be light, crisp and aromatic, often with a light prickle of fizz, sometimes with a touch of sweetness. The fine Alvarinho grape rules around the towns of Melgaço and Monção in the north, along the Minho river. The climate here is warmer and drier, the maritime influence partially blocked by hills, and the combination of grape and climate makes for richer, fuller, subtly complex wines, made dry and totally still. There are nine sub-regions to the DOC, named after rivers or towns: Monção, Melgaço, Lima, Basto, Cávado, Ave, Amarante, Baião, Sousa and Paiva. A trip to the Quinta da Aveleda is not only synonymous with vines lose sight and a cellar with advanced technology which produces one of the Vinho Verde sold worldwide. Sign in Aveleda is to make a real trip to the time of Minho families living on solar typical of the region. Who goes through Monsoon is not indifferent to the imposing Palace of Brejoeira. Considered a national monument since 1910, is a grand building in neo-classical style of the early nineteenth century. In Tras-os-Montes region vine growing is secular. There are references that show wine production during the Roman occupation in the region. These wines were known for their great quality. 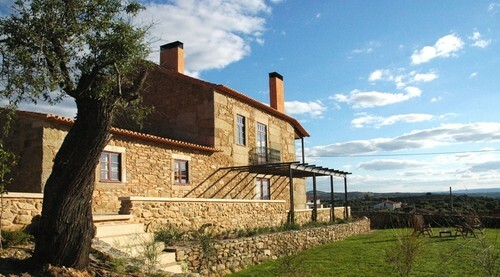 In eighteenth-century building, the mid-18th century, the Casa Grande do Seixo as it is known, is in the village in which it operates a marked presence of great architectural, historical and cultural value. Casa Grande do Seixo supported on the main street of the village prevails over all mesh built as a major element of rural and religious experience which remain to this day. 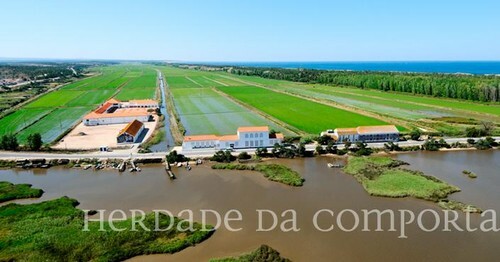 Set in a fertile plain located between the hills of Falgueira east and the mountains of the Barrocal to the west which flows the river of Oura, is crossed by paths that connect the beautiful rural roads of secular characteristics where a landscape of pure nature. In addition to the evidence of wines and liquors, also can make cycling in the area and hiking the trails that surround the vineyards. This is one of the wildest, most mountainous and rugged wine regions of Portugal, cut through in deep twists and turns by the River Douro. Defying gravity on the steep slopes along the banks of the river and its tributaries, the vines are planted in poor, schistous soils. Man has engraved his own contours here – in the centre of the region, the historic, narrow, stone-walled vine terraces have been named a UNESCO World Heritage Site, while elsewhere, modern terraces are wider, buttressed by steep banks of earth. 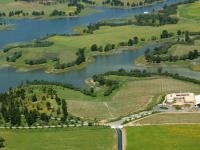 The wine region follows the course of the river down from the Spanish border to a point near the town of Mesão Frio, about 90km up-river from the city of Porto (Oporto). Here the Serra do Marão rises up, protecting the region from the influence of the Atlantic Ocean. The Cima Corgo, including the towns of Pinhão, São João da Pesqueira and Tua, is the heartland of fine port production, also the source of many of today’s fine unfortified wines. The Douro Superior, very cold in winter, infernally hot in summer, is the biggest of the sub-regions (by no means all planted but much planting is underway). The Douro has a huge selection of local grape varieties, and many vineyards of impressive, gnarled old vines that give small yields of rich, complex wine, whether for port or for unfortified wines. Dozens of different grape varieties may be mixed together in these old vineyards. In modern vineyards, vines are planted separately, and five grapes have been declared the top choice for port: Tinta Roriz, Touriga Franca, Touriga Nacional, Tinta Barroca and Tinto Cão. Plantations of the red-juiced, high-acid Sousão, as known as Vinhão elsewhere, have increased recently. Another black grape much planted in older vineyards is Tinta Amarela (as known as Trincadeira). Amongst whites, notable grapes are Gouveio, Malvasia Fina, Moscatel, Rabigato and Viosinho. Some of these, from old, mixed-variety vineyards at high altitudes, are being used for a new generation of dry white wines. With the development of exports of port began the practice of adding him brandy. Thus, the wine resisted unchanged to travel at sea and stopping the fermentation with brandy made the wine sweeter and suitable to the taste of the English market. In 1756 created the General Company of Agriculture of the Upper Douro Vineyards. This body had as its main responsibilities to the limitation of the region and vineyard register, classify wines according to their quality and establish certain wine practices in the region. It was the birth of one of the first specific regions of the world. The name "Porto" is explained by the fact that the wine be stored and marketed from the port located between the city of Porto and Vila Nova de Gaia. The wine went down the river Douro in Rabelo boats and aged in warehouses of Vila Nova de Gaia, as this area has few variations in temperature during the year. 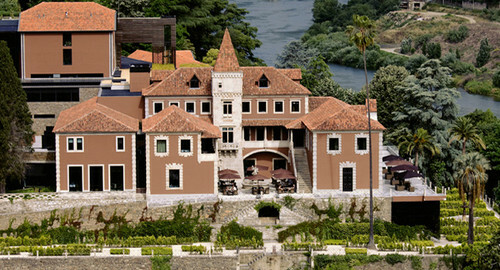 The most expensive Porto wine and rarest in the world is produced by Quinta do Noval. Your Porto Nacional Vintage is produced few times and always in limited numbers (200 to 250 boxes). One of its peculiarities is that the grapes come from vines planted without rootstocks, very old and rare in the region. Opened in June 2007, in the fifth valley of Abraao, the Aquapura Douro Valley results from the recovery of a solar-19th century, having been transformed into a modern space set in a bucolic setting. It is characterized by sophisticated atmosphere that ranges from the intimate ambience of the rooms and public, large and bright spaces. In the heart of the Douro region, this hotel resulting from an adapted cellar and which was renovated in 2009 is situated in the bank of the Douro and offers spacious and comfortable rooms enjoy views of the river. The Wine House Hotel is set in Quinta da Pacheca, one of the oldest properties of the Douro and pioneer in private label wine bottling. The estate house, with typical architecture of the 18th century, was restored in 2009 and now serves boutique hotel. This offers rural characteristics, but with tears of great contemporary and comfort, being entirely devoted to the gastronomic and wine tourism. This is a small, remote, mountainous region in the north of the VR Beiras, bordering on the Douro to the north, and the Dão region to the south. The climate is continental, with extremes of temperature, and vines grow at 500 to 800 metres above sea level on granite or schist soils. At this altitude, the grapes retain good acidity and fruit, and are perfect for production sparkling wines – indeed this was the first region in Portugal to be demarcated for sparkling wines, in 1989. Malvasia Fina accounts for about half of older vineyards, along with Bical, Cerceal, Fernão Pires and Gouveio, while major reds are Tinta Barroca, Tinta Roriz, Touriga Franca and Touriga Nacional. For nearly a century, Távora-Varosa has also had significant plantings of Chardonnay and Pinot Noir (two of the major grapes of the Champagne region of France) and more is being planted. With an admiring eye on the success of the Douro producers to the north, Távora-Varosa producers have also been planting more of the top Portuguese red grapes, such as Touriga Franca, which ripen less well in these conditions, however. 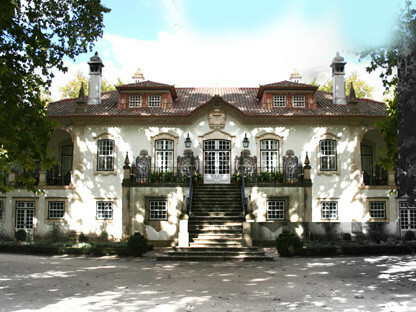 Quinta de Cabriz is located between the two main rivers that cross the region of Dão, the Mondego and Dão. It is a secular farm where besides the house of the 17th century there is also a chapel. Although much of the Bairrada region is hilly, the majority of the vineyards are on flatter land. Vineyards are often divided into a multitude of small plots. There are two main types of soil: clay-limestone and sandy, each influencing style of wine. This is a very important area for sparkling wines. Base wines for sparkling wines need the kind of high acidity that the cool Bairrada climate delivers. Sparkling Bairrada wines may have the fragrance of the Maria Gomes grapes (also known as Fernão Pires), or they may be more steely, based perhaps on Arinto, Bical and Cercial, sometimes with some Chardonnay. There are also ‘blancs de noirs’ based on quickly-pressed Baga. Baga is the traditional local red grape. It makes tannic wines that can have high acidity if under-ripe, but if ripened and handled well the Baga can give rich, dense fruity reds that age into elegant wines of great complexity. Since 2003, a multiplicity of other grapes has been permitted in DOC Bairrada wines – national grapes such as Touriga Nacional and Alfrocheiro as well as the international likes of Cabernet Sauvignon, Pinot Noir, Syrah and Merlot. During D.Maria's reign (1734/1816) the wines were largely exported to Brazil, where they were much appreciated. They were also exported to North America, France and England. In 1137, D.Afonso Henriques approved the growing of vines in the Herdade de Eiras, under the public road from Vilarinum to Buzaco. The payment to the crown was just the fourth part of the wine produced. 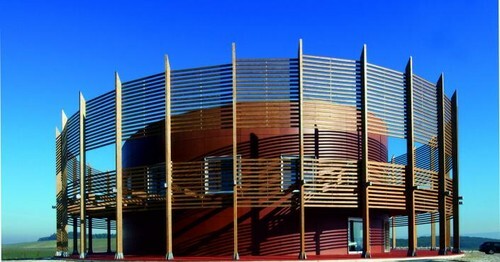 A dream and passion for the wines, we created the vision of forms and exterior and interior lines in perfect harmony conceptual, between the production of wine and architecture. To find the building shall be free, almost eyes closed, go without barriers our science and art of producing wines of excellence, and have a unique sensory experience in a cellar design. We organize visits and tastings, that stimulate your senses, from music that merges with the characteristic aromas of the wine production, will taste experience of original flavors of lush signature cuisine. This region's wine was served at the luxurious celebrations organised by Infante D.Henrique in Viseu before the Portuguese embarked on their journey to conquer Ceuta. When phylloxera struck European vines there was a great demand for this region's wine, which would be used to replace Douro's (since the Douro region had already been invaded by phylloxera) and sell table wine to the French market. Between 1883 and 1886, phylloxera reached the Dão region. It is in Santar village that is the Paço dos Cunhas de Santar a property of the 17th century which was dedicated to the production of olive oil, fruit and wine to supply the city of Porto markets. Vine growing in this region dates back to the Roman era. One can still find several rock tanks that were used to produce wine. As these were high quality wines very important social and economically, some measures were taken to protect them, namely during the reign of D.João I (1430) and D.João III (1545). 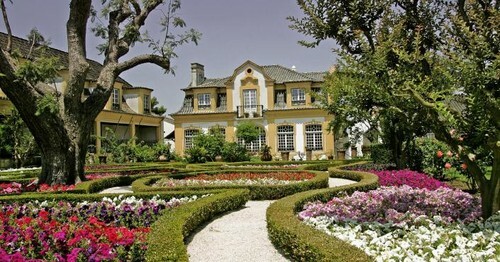 Quinta de Pêro Martins, got situated in a village of Figueira de Castelo Rodrigo municipality (Guard), inserted in the Côa Valley Archaeological Park and near the Douro Wine Region and the Douro International Natural Park. It was intended at the same time preserve the interesting aspects of this core of Beira rural architecture and provide guests with a quality service with comfort and diversity of tourist entertainment activities. West and north of the city of Lisbon, the Lisboa wine region was until recently known as Estremadura. A lot of wine is made here, much of it in co-operatives, in a very wide variety of styles and qualities. 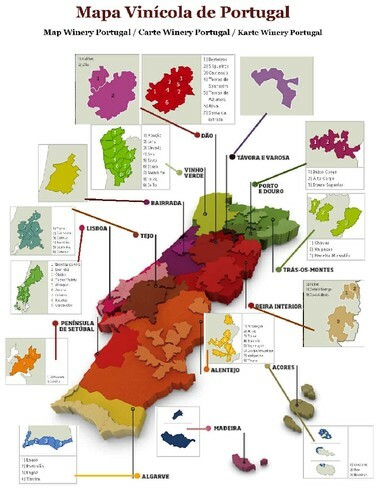 This region where the "vinho regional" Lisboa is predominant also has nine DOC. Lisboa is a long, thin region running up beside the Atlantic. Wind is inevitably a strong feature beside the coast – no wonder that these undulating hills bristle with windmills, and no wonder that coastal vines are wind-stressed and hard pressed to ripen their grapes. Just a little way inland, however, a backbone of hill and mountain ranges offers some protection to many eastern parts of the Lisboa region. A number of the top wine estates of Lisboa are in or around the DOC region of Alenquer, tucked in to the east of the Serra de Montejunto, and therefore a little warmer, a little less windy and wet. Grapes can ripen well, and red wines especially can be top class. DOC Arruda likewise is protected behind hills, just to the south of Alenquer. These two DOCs, along with DOC Torres Vedras (to the cooler, windier east of Alenquer), relaxed their grape restrictions in 2002 to allow some new national and international grapes including Cabernet Sauvignon, Touriga Franca, Syrah, Sauvignon Blanc and Chardonnay. Just south again, between Arruda and the city of Lisbon, is the small but high-quality white wine region of Bucelas, with sheltering hills to the west and the wide, nearly land-locked estuary of the Tagus to the east. DOC Bucelas is a fresh, crisp, dry, mineral white, made with a minimum of 75 per cent Arinto, sometimes with Rabo de Ovelha and Sercial. There is also sparkling Bucelas. A gap in the hills on a level with the Peniche Peninsula and the town of Óbidos means that the DOC Óbidos, region in the centre-east of VR Lisboa is windy and cool. These are ideal conditions for growing grapes for sparkling wines, and indeed some of Portugal’s best sparkling wines come from Óbidos. The DOC of Lourinhã, between the Óbidos wine region and the ocean, is cooler and windier still, and this DOC, whose grapes ripen with difficulty, is therefore restricted to brandies. The largest DOC region within the VR Lisboa area, up in the north, on the western slopes and hills of the Candeiros and Aire mountains. This is scenic, limestone country, clothed with orchards and olive groves as well as vines. It is possible to make good, rich reds and modern whites, but some traditionally-made wines here are low in alcohol, high in acidity, known as DOC Encostas de Aire. Very little wine is made nowadays in the DOC Colares and Carcavelos, two once- famous wine regions by the coast, out west from Lisbon. This is prime beach and residential country, where there are many more lucrative uses of land than growing grapes. Carcavelos, just west of the capital, makes tiny quantities of fortified wine that is nearly always sweet, from red or white local grapes. Colares, neighbouring the great surfing beach of Guincho, makes high-acid, tannic wines from red Ramisco grapes, planted in sand dunes, and gently aromatic whites based on Malvasia. For the Lisboa region as a whole, the main traditional white varieties are Arinto, Fernão Pires, Malvasia, Seara-Nova and Vital, and for reds Alicante Bouschet, Aragonez, Castelão, Tinta Miúda, Touriga Franca, Touriga Nacional and Trincadeira, but many other national and foreign grapes are now used for VR wines and certain DOC wines. This wine was very famous in the time of the French Invasions (1808-1810). Wellington was very fond of Bucelas wine and took it to England with the intention of offering it to King George III. Wellington's troops would frequently drink this wine and took this custom to England. Thus, for several years, Carcavelos wine was widely exported to that country. In the second half of the 16th Century, Bucelas wine was already known in England. The English would call it "Lisbon Hock", meaning dry white wine. The Adega Mae was born of an old flame within the Riberalves Group: Wine. 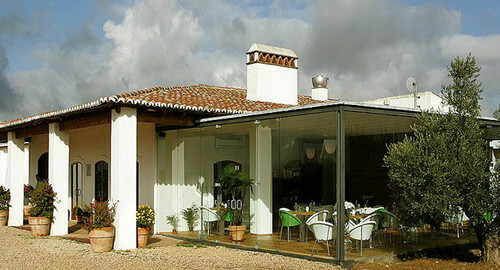 Located in Quinta da Archeira, parish of Ventosa, has an area of ​​approx. 40 hectares devoted to vineyards and a production capacity of 1.2 million liters per year, thus giving rise to a complete range of wines. 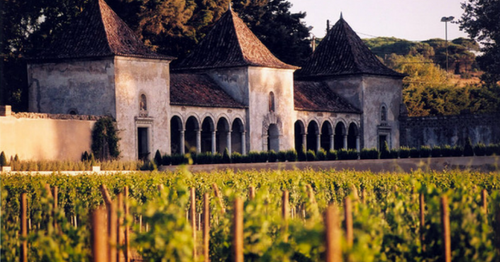 The Adega Mae is the top-notch wineries, a temple erected to wine and worship associated with it, discerning, demanding time to produce / sell, available, currently open to share. 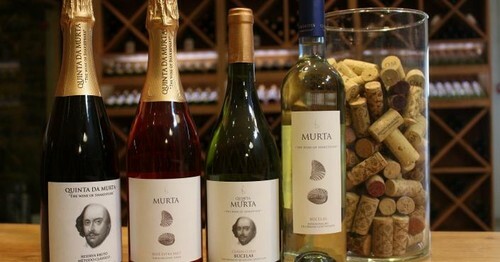 Quinta da Murta is removed by the looks soft limestone hills of Bucelas region. It is located about 25 km north of Lisbon, in the Lusitanian basin, whose soil dating from the Jurassic period. DOC Do Tejo occupies almost the same large area as VR Tejo, on either side of the River Tagus (Tejo in Portuguese) as it flows gently along in a south-westerly direction towards its estuary at Lisbon. Until recently the DOC was called Ribatejo and the "vinho regional Ribatejano". Climatic and geological conditions vary greatly throughout the region. A lot of the vines grow, along with huge quantities of vegetables, on the wide, alluvial plain of the Tagus, in soil known as leziria, very fertile and frankly over-productive as far as quality wine is concerned – unless growers commit great attention and time to reducing their crops and pruning back the exuberant vegetation. Many growers deliver to large co-operatives. Some quality-conscious producers have focussed their attention on the hotter, drier, sandy land to the southern side of the river, to the east of Muge, Almeirim and Salvaterra de Magos, bordering on the Alentejo. Soils here are known as charneca. On the other side of the Tagus but further north, heading up towards the border with Lisboa region and the foothills of mountains of the Encostas de Aire, the soils are clay-based, and known as bairro. In the west of the Tejo region, around Rio Maior, sea air passes through a gap in mountains, making the climate wetter, windier and cooler. The DOC regulations allow a fairly wide range of grape varieties, for whites the local Fernão Pires, Alicante Branco, Arinto, Tália, Trincadeira das Pratas and Vital, but also Chardonnay and Sauvignon Blanc, and alongside the traditional red Castelão and Trincadeira it is possible to use Aragonez, Touriga Nacional, Cabernet Sauvignon and Merlot. The wines from Ribatejo were already famous before Portugal became a country. In 1770, in the foral (royal document) of the city of Santarém, D.Afonso Henriques made reference to these wines. From the 13th to the 15th Century, a number of measures were taken by Portuguese kings to protect this region's wines. One of such measures was to prohibit the entrance of wines produced outside the region. Gil Vicente, in his book Pranto de Maria Parda, makes reference to the wines produced in Ribatejo, namely the one from Abrantes. In the book Viagens na Minha Terra, by Almeida Garrett, one talks about Dâmaso Xavier dos Santos, a big farmer from Cartaxo who dedicated himself to the Liberal cause, ruining his entire wealth.. Located 80 kilometers north of Lisbon, on the left bank of the Tagus River, the Estate of Muge, belonging to the family Alvares Pereira de Melo (Casa Cadaval), has a total of 5,400 hectares, of which most occupied by mounted. 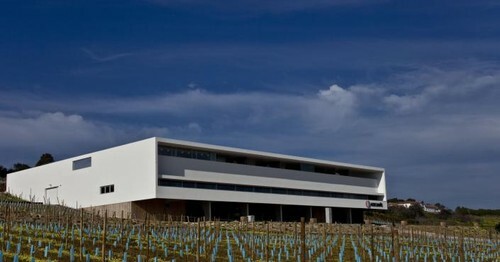 Currently holds about 42 hectares of vineyards, whose vine varieties consists mainly of indigenous varieties, highlighting the Trincadeira, Touriga Nacional, Aragonez, Arinto, Alvarinho and Fernão Pires and lower percentage of foreign varieties, Alicante Bouschet, Cabernet Sauvignon, Pinot Noir and Merlot, used for the production of wines of this house, maintaining the philosophy of maintaining the Identity and Expression of Terroir in each of their wines. The Setúbal Peninsula lies across the estuary of the River Tagus directly south of Lisbon, and linked to Lisbon by two bridges. The wine region Península de Setúbal also includes a large coastal chunk of the administrative region (as opposed to the wine region) of Alentejo. Much of the area is flat and sandy, with the exception of the Serra da Arrábida, a short chain of mountains running along the south coast of the peninsula, where the soils are limestone or clay-limestone. It is on these Serra da Arrábida slopes that the grapes are grown for the famous sweet Moscatel de Setúbal wines. The climate is Mediterranean, with hot, dry summers and mild but rainy winters. Vineyards in the Serra da Arrábida are cooler, owing to the higher altitude and the proximity of the sea. The Vinho Regional was recently renamed Península de Setúbal. (it was formerly called ‘Terras do Sado’ after the River Sado that flows through the southern part of the region). There are two DOCs, Setúbal and Palmela. Setúbal is sweet and fortified, made primarily from the Muscat of Alexandria grape. It can be labelled Moscatel de Setúbal when Muscat makes up more than 85 per cent of the blend. It’s a very sweet, fragrant wine, with candied orange flavours, floral and raisiny when young, developing nutty, toffeed aromas with maturity. Moscatel Roxo (a pink grape) makes wines that are even more scented. DOC Palmela is mainly red, and based on the late-ripening Castelão grape, which is more at home in the hot, sandy soils of Palmela than anywhere else in Portugal, ripening well to make wines of complexity and depth, elegance an balance, with good cherry fruit. Moscatel was much exported to America, namely Brazil. When the wine was not sold, it would return to Portugal. Transportation was done in ships that crossed the Atlantic. Therefore, the wines were subject to high temperatures throughout the journey. Once arrived at the port, one would notice that the wine in the barrels was more concentrated and softer. These wines became known as torna-viagem (free translation: return trip), since they would make a trip out of Portugal and return to the country. Wine is thought to have been brought to Portugal by the Phoenicians around the year 600 BC, namely through the estuaries of the rivers Sado and Tejo. The Phoenicians were looking for metals and, as an exchange currency, would offer, among other products, wine and oil amphoras. Founded in 1834, José Maria da Fonseca wine has at a truly secular passion. In his House Museum in Azeitão, about 30 minutes from Lisbon, you can visit, you Interview other points of interest, the cellars where the Periquita matured for over 160 years; and the cellar where they are stored muscat as old as the company and belonging to the private collection of Soares Franco family, direct descendants of the founder. It may also, in the Wine Shop, do a wine tasting, and lose yourself in choosing a wine for that special occasion. Tradition and quality at your disposal, so close. Considered the most beautiful farm first half of the 15th century still existing in Portugal, Quinta da Bacalhôa is an old property of the Royal House. 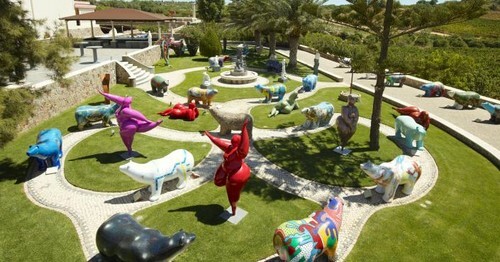 Located in Azeitão, Quinta and the famous Bacalhôa Palace is an artistic monument of great importance for the country. Visit associates Wine, Nature and Art. Of ancient olive trees transplanted from the Alqueva dam to the gardens of the cellar, to the interior of the premises, the route continues to amaze. Inside, more than 2,500 barrels to Setubal muscatel aging fall with the largest private collection of tiles in Portugal, giving you the know the heritage of the company, with over 80 years of history. THERE IS A PLACE COMPORTA.SÓ ASSIM.SÓ SO THERE IS A WINE. The Alentejo region covers about a third of Portugal, and winemakers in the remaining two-thirds can often be heard to complain about the popularity of Alentejo wines.The reds, easy drinkers, rich and fruity, are the darlings of Lisbon cafés and restaurants, also to be found on wine lists the length of the country. There are quaffing wines, but also fine wines, especially in the red department. Whites are more difficult in this hot climate, but some very good ones are made, given the right place, and/or appropriate skill in vineyards and cellar. The Roman presence in Alentejo contributed to the implementation of the vine in several areas of the region. After the foundation of Beja, between 31 and 27 BC, there was a great increase in the growing of vines. Pieces of pottery, grape seeds and a granite press were found near Vidigueira. After expelling the invaders from Alentejo, the royal authorities and religious orders encouraged the production of wine. The population was forced to grow vines and, after three to five years, donate a certain part of their yield. In 1221, D.Afonso Henriques established that the grapes and wine produced would be property of the Sé de Évora. In the heart of Alentejo, wrapped in the bucolic scenery, Herdade da Malhadinha Nova Country House & Spa is a rural hill typical Alentejo. The hotel with spacious and elegant rooms is on the Mount of Peceguina, surrounded by lavender fields and vineyards. The Esporão is one of the oldest wine tourism units in Portugal. Opened in 1997 and the space, recently refurbished, offers wine bar, restaurant and of course, visits to the winery and vineyards. In addition to the activities related to wine, you can also enjoy the gardens that connect the vineyards and wineries and visit the garden of 2 hectares of the estate, where they are planted fruits, vegetables and herbs. The Herdade do Rocim is a property of about 110 hectares, of which 70 are vineyards and which includes the cellar, structuring element of the project, which combines the production of wine with the enjoyment of the space and nature, with its use as a center of culture and leisure. The Herdade dos Grous is inserted into the broad plain of the Lower Alentejo among olive, cork oak forests and 70 hectares of vineyards. The property is an ideal place to relax, be in touch with nature and learn more about raising horses and cattle, production of wine and olive oil or organic farming. On a visit to the winery Herdade dos Grous can know the stages of the winemaking process and do a wine tasting. In Estate of the store can purchase wine, olive oil and ceramics produced in Homestead. Monte da Ravasqueira is a place where you can discover all the culture and history linked to the company's wines. Be impressed by the extent of the vineyards and enjoy the cellar architecture that follows the models used in Napa Valley, California. You will certainly feel at home and will want to stay to enjoy the traditional cuisine of meals offered by Hill meal service (but be sure to book). During the Muslim occupation of the Algarve, the vine was widely cultivated. As Muslim religion doesn't allow the ingestion of alcohol, the wine would be used as a transaction currency to acquire other products. After reconquering the Algarve, the Christians used the Muslims' economic organisation. Algarve's wine tradition is not limited to cultivating and producing wine: the region has played an extremely important role in the commercial trades made during the Middle and Modern Ages. Active and relaxed, dynamic yet serene. Opposite approaches to the same goal: quality. 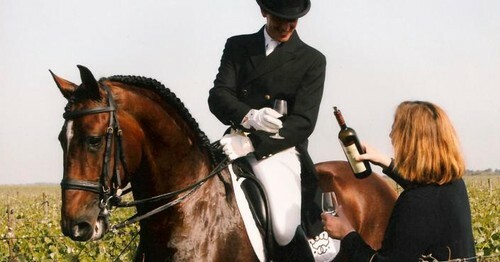 Quinta dos Vales is synonymous with quality in all their efforts. Whether our conservative approach to the production of wine or a unique combination of wine and art the goal always remains the same. Customer satisfaction is the minimum we want to achieve is in the area of wine, art, events or wine tourism. The activity of our company is divided in different areas: Wine, Art, Rentals, Activities and Events; click the section below for details on each. The Azores, discovered in 1427 by Diogo Alves, are made up of nine islands. In the same year, the first settlers arrived in the islands and started growing vines. Verdelho is the most famous and most grown grape variety in the Azores. It is thought to be originally from Sicily or Cyprus and afterwards taken to the Azores by the Franciscan Friars, who cultivated it throughout the islands. In the 17th and 18th Centuries, the wines produced in the Azores, namely the ones produced in Pico, were exported to Russia and most northern European countries. After the Russian revolution in 1917, several bottles of Pico Verdelho were found kept in cellars belonging to ancient Russian czars. Madeira's fortified wines keep practically for ever - they have been known to survive for more than two centuries. Out in the Atlantic, on the same latitude as Casablanca, the island enjoys mild temperatures throughout the year, but the climate is also strongly influenced by the ocean. It is extremely mountainous, with deep valleys and steep slopes where the vines grow on little terraces in fertile, acid, volcanic soils that are very rich in organic matter. Vines are mostly trained on traditional pergolas, the bunches hanging below, shaded from the sun by exuberant foliage. Yields are high. The resulting grapes have high acidity – a distinguishing feature that they pass on to all Madeira wines. A small clutch of historic Madeira grapes are known as the ‘noble’ varieties: Sercial, Verdelho, Boal, Malvasia (sometimes called Malmsey) and the rarer Terrantez. All are white, and the first four are traditionally vinified to give different degrees of sweetness in the finished wine: respectively dry, medium-dry, medium-sweet and sweet. Terrantez makes fine, dry wines with very marked acidity. However, 80 per cent of the island’s vineyards are planted with another variety, Tinta Negra, which is made into fortified wines of all four traditional sweetnesses. Some table wines are also made on the islands. In Shakespeare's play "Henry IV" there are references to Madeira wine. The character named Falstaff sells his soul to the devil "for a cup of Madeira and a cold capon's leg". Madeira was considered a very elegant wine. Court ladies would even use it as a perfume on their handkerchiefs. In England, Madeira and Port would compete for the first place in the court's preference. The Duke of Clarence was a noble Englishman who, after being sentenced to death for attempting to murder his brother, Edward IV, chose to die by drowning in a Madeira Malvasia cask. Madeira wine was widely exported to England, France, Flanders and the United States. Francisco I (1708/1765) used to say that Madeira was the richest and most delicious wine in Europe. Important families from Boston, Charleston, New York and Philadelphia would compete among themselves to get the best Madeira wines.